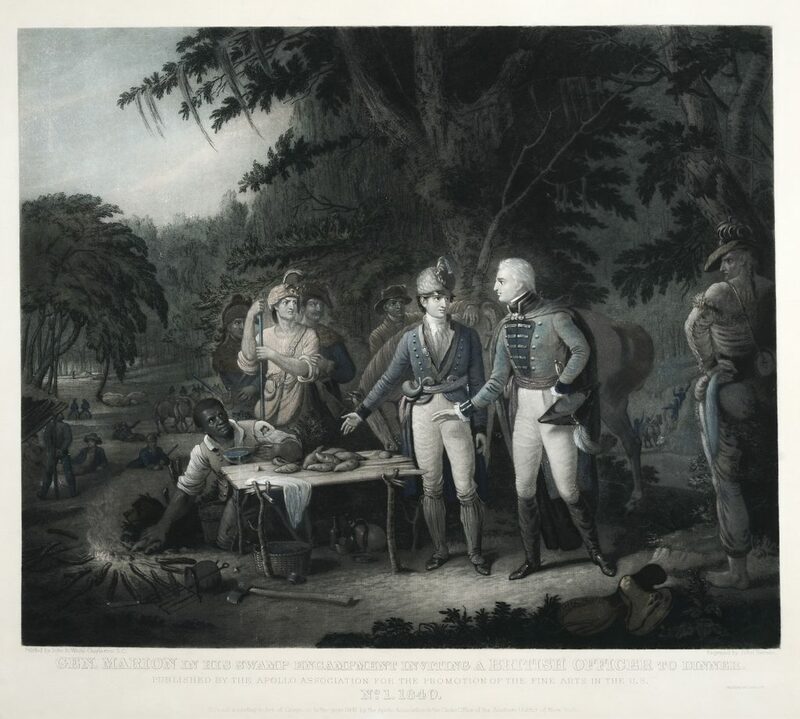 The Institute’s print holdings provide a thorough visual record of the era of the American Revolution as it was seen by its contemporaries and commemorated by subsequent generations. The collection is particularly strong in political cartoons and caricatures, which provide sharp commentary on the international politics and policies that shaped the period from the Seven Years’ War through the Treaty of Paris in 1783. The collection includes contemporary views of important places and events on both sides of the Atlantic. 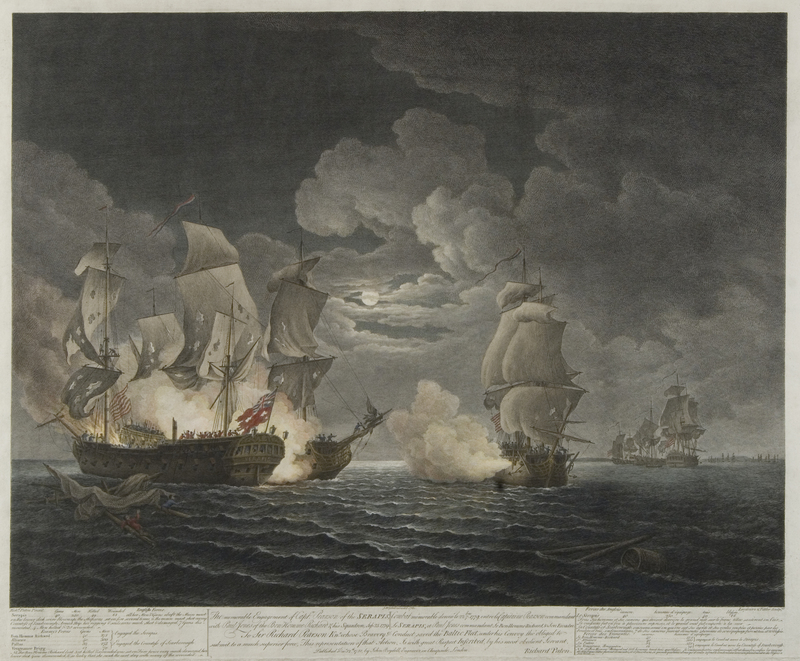 Printed depictions of battles, on land and at sea, found a ready market among a public eagerly following the news of the war. Preparations to defend the British homeland against invasion in the late 1770s generated an outpouring of prints reflecting the pride and fears of the nation. In America, the public’s first glimpse of the events of the war often came from simple woodcut engravings circulated in printed periodicals. The collection also features portraits of the leading military and political figures of the revolutionary era. George Washington is especially well represented with more than three hundred portraits, from the earliest fictitious images that circulated at the beginning of the Revolution through the mass-produced prints of the nineteenth century that immortalized America’s first and greatest hero. The highlight of the collection is Charles Willson Peale’s 1778 mezzotint portrait of Washington, the first authentic likeness of him to appear in print. By the 1840s, photography offered new ways to produce images of the aging Revolutionary generation. The daguerreotype, a silver-plated sheet of copper onto which an image was exposed, was the most popular format until about 1860. In addition to capturing a living person’s likeness, early photography also provided families with a way to preserve and share images of painted portraits of their ancestors. The collections include several daguerreotype portraits of Revolutionary War veterans, whether taken from life or from paintings. During the era of the Civil War, photographic prints of the last surviving Revolutionaries were published and sold to the public as a reminder of the sacrifices of the generation that had secured American independence. 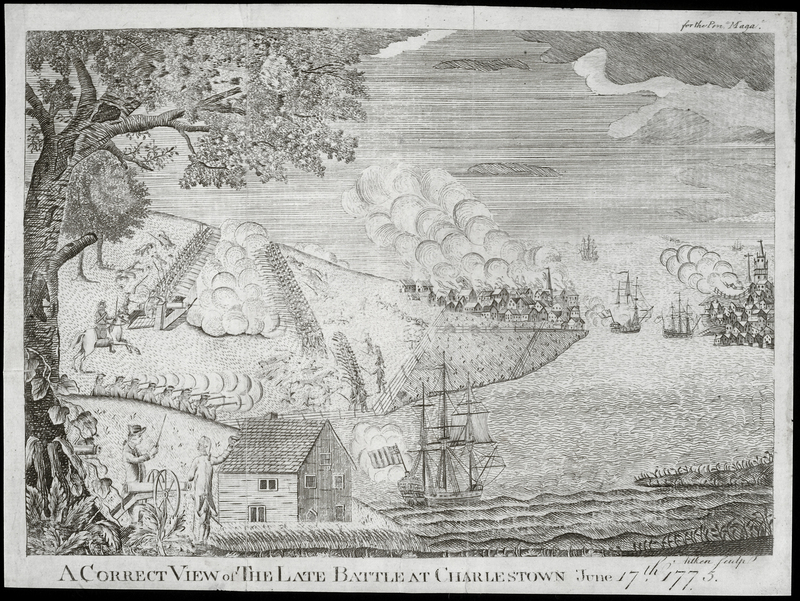 Published as a fold-out frontispiece of the September 1775 issue of The Pennsylvania Magazine, this engraving, based on the work of Bernard Romans, was the earliest depiction of the Battle of Bunker Hill to be circulated to the American public. It shows General Israel Putnam on horseback commanding American troops on Breed’s Hill as they confront a line of advancing British troops, while Charlestown burns in the background. 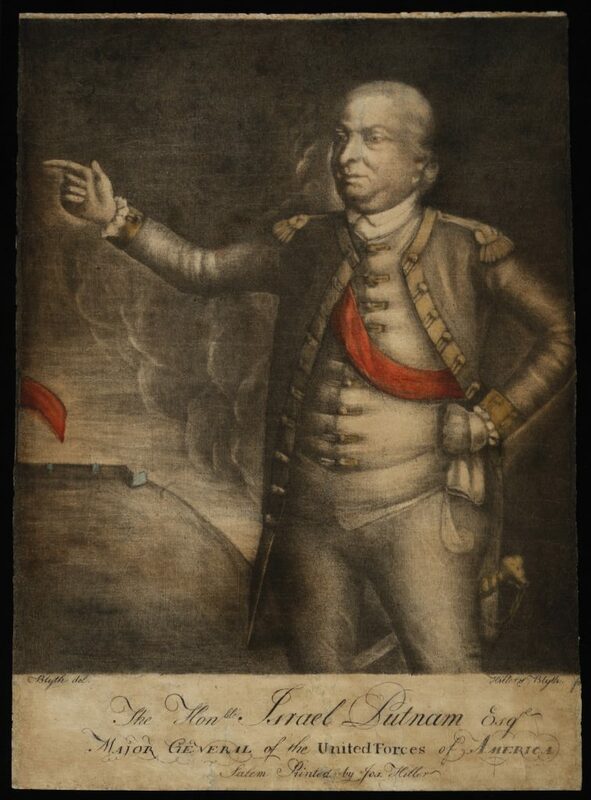 This is one of only two known examples of this rare mezzotint of General Putnam produced in America at the beginning of the Revolutionary War. It is unique in its contemporary hand-coloring, showing Putnam’s reddish-orange sash as it was prescribed by Washington’s orders at Cambridge in June 1775 as a distinction for brigadier and major generals. The standard of Putnam’s regiment, of the same reddish-orange color, flies in the background. 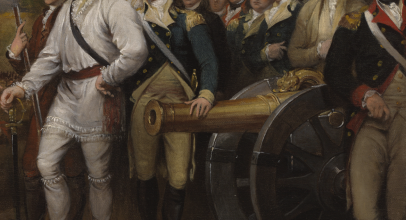 This work is considered the earliest printed portrait from life made of any American officer of the Revolutionary War. 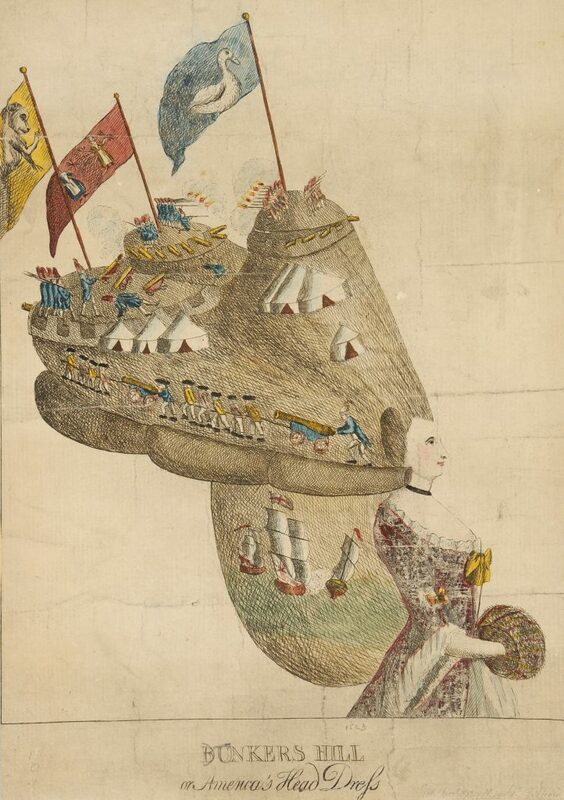 Published on the first anniversary of the Battles of Lexington and Concord, this pro-American satire depicts a great military battle taking place in a fashionable woman’s enormously tall coiffure, complete with ships, marching soldiers, cannon, flags and tents. 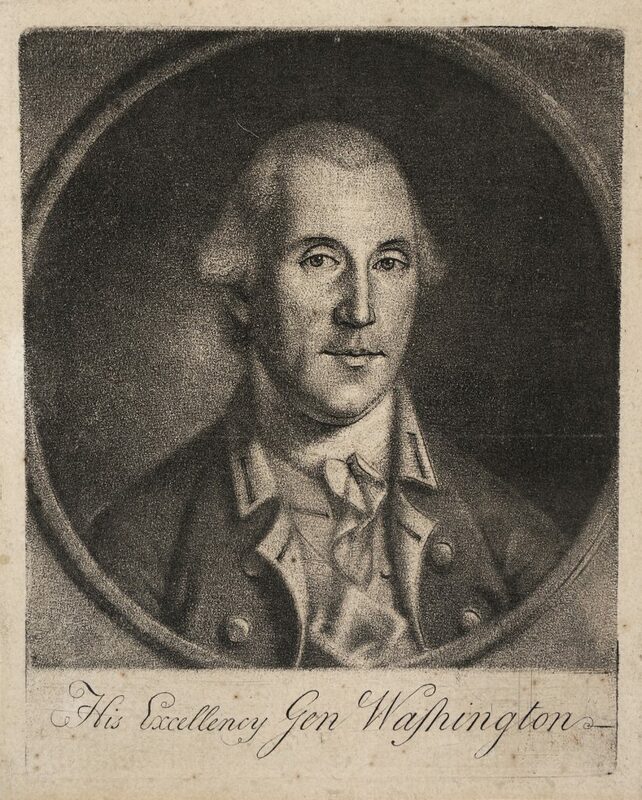 Charles Willison Peale’s 1778 mezzotint was the first authentic printed likeness of George Washington created by an artist who had painted him from life. 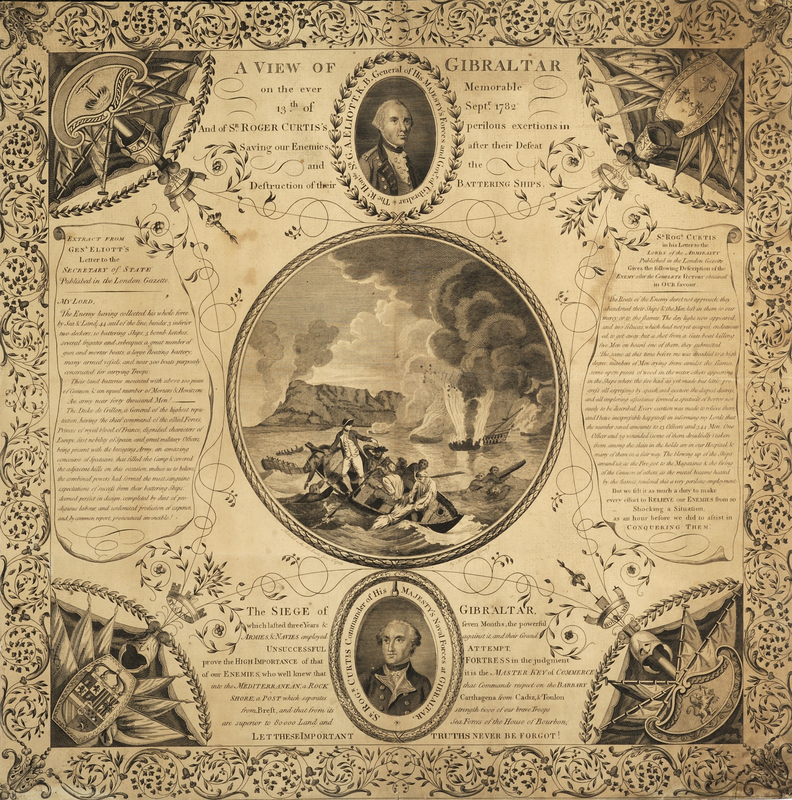 Although relatively few copies of the original print were sold to the public, it was widely copied by other engravers and Peale’s “face of Washington” became the most recognized image of the American leader during the war. The Institute’s copy is one of only three of Peale’s original prints known to survive. Located about forty miles southeast of London, Coxheath Camp was the largest of the special military training camps established to defend the British homeland during the American war. It became a popular tourist destination for thousands of visitors, including George III and Queen Charlotte, who traveled from London and elsewhere to watch maneuvers and mock-battles. This is a copperplate engraving of a design for a handkerchief commemorating the Siege of Gibraltar. The center medallion depicts British naval officers rescuing drowning Spanish sailors whom they had just defeated in battle. 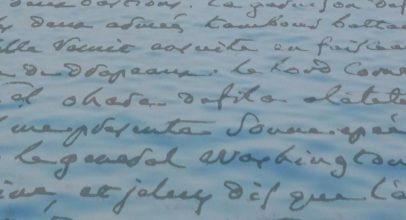 The text provides first-hand accounts of the battle by Sir George Augustus Eliott, governor general of Gibraltar, and Sir Roger Curtis, who was knighted for his role in the rescue effort. 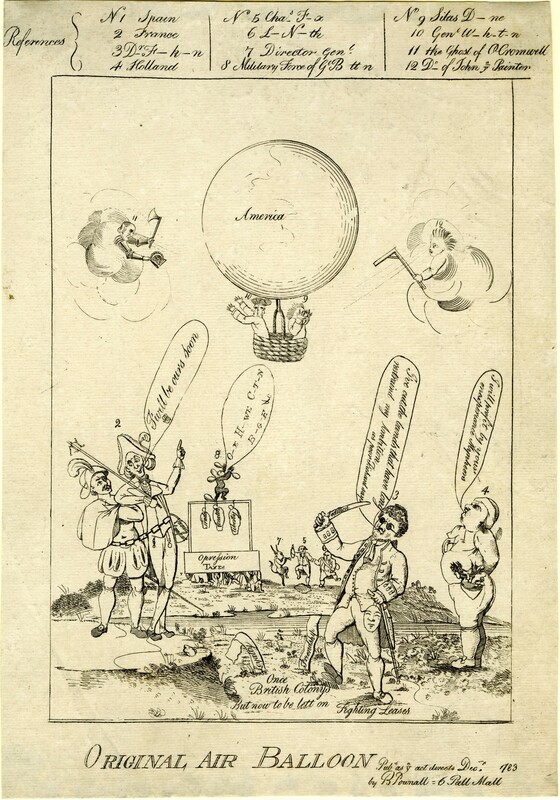 One of the last satirical prints of the Revolutionary War, this print depicts America as a hot air balloon, precariously suspended over representations of France, Spain and Holland, all musing over the possibility of influencing the new nation. A two-faced George Washington in the balloon’s basket reaches toward a sword proffered by the ghost of Oliver Cromwell. 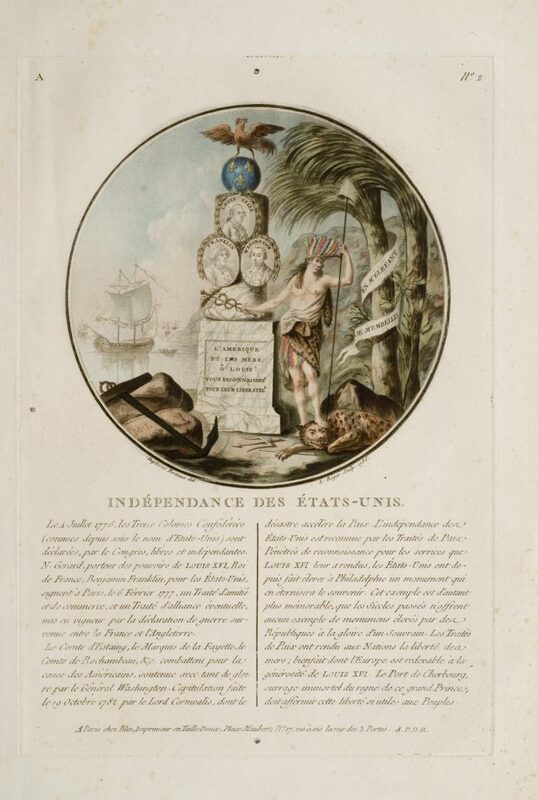 This allegorical image celebrates the alliance of France and the United States and their victory over Great Britain. America is represented by an Indian woman resting her foot on the defeated British lion. She stands beside a monument bearing portraits of Louis XVI, Benjamin Franklin and George Washington. Peter Francisco, by legend a foundling from the Azores taken in by a family in Virginia, joined the army at the onset of the Revolutionary War. He was known for his massive size and strength—six feet and eight inches in height and weighing 260 pounds. 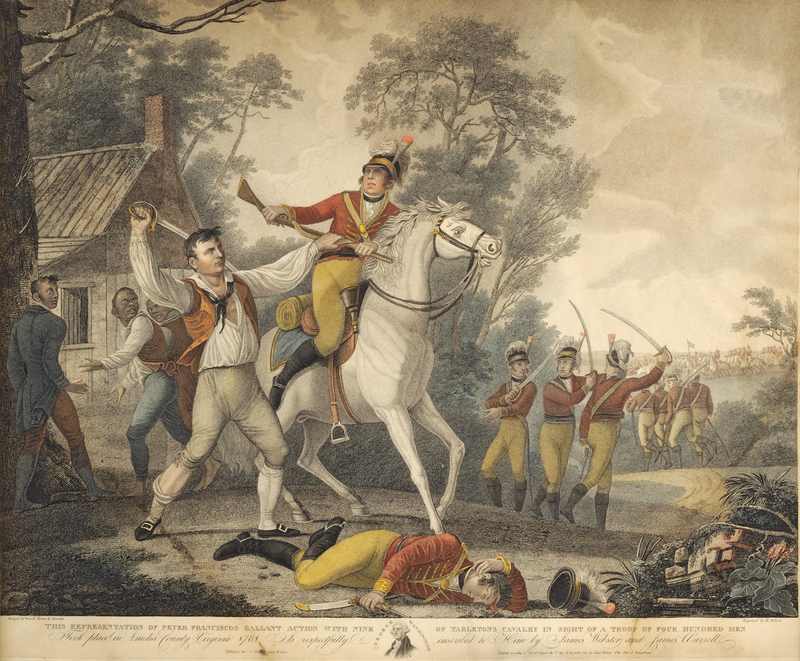 This engraving depicts his best-known action, when he single-handedly fought off nine British soldiers, knocking one off of his mount and escaping on the horse. John L. Grubb, Alexandria, Va. 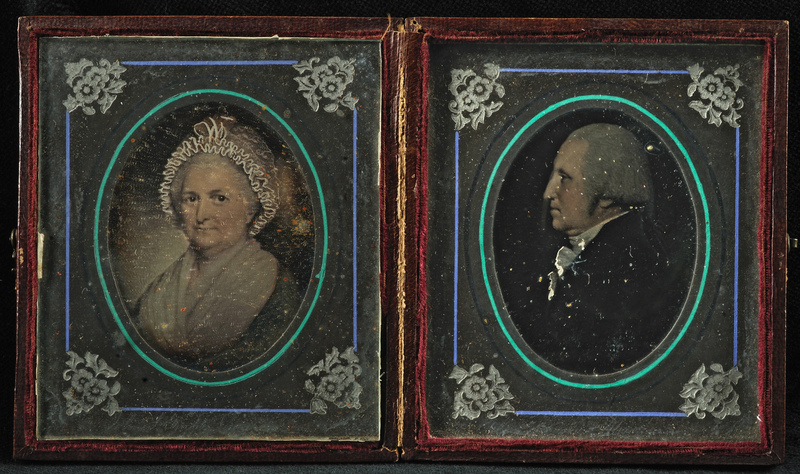 This pair of daguerreotypes reproduces well-known portraits of George and Martha Washington both originally painted around 1796—James Sharples’ profile portrait of General Washington and Gilbert Stuart’s Athenaeum portrait of the general’s wife. These keepsakes are enclosed in a hinged leather-covered case. John Richard Watrous (1753-1845) of Colchester, Connecticut, was a surgeon in the Connecticut Continental Line during the Revolutionary War. 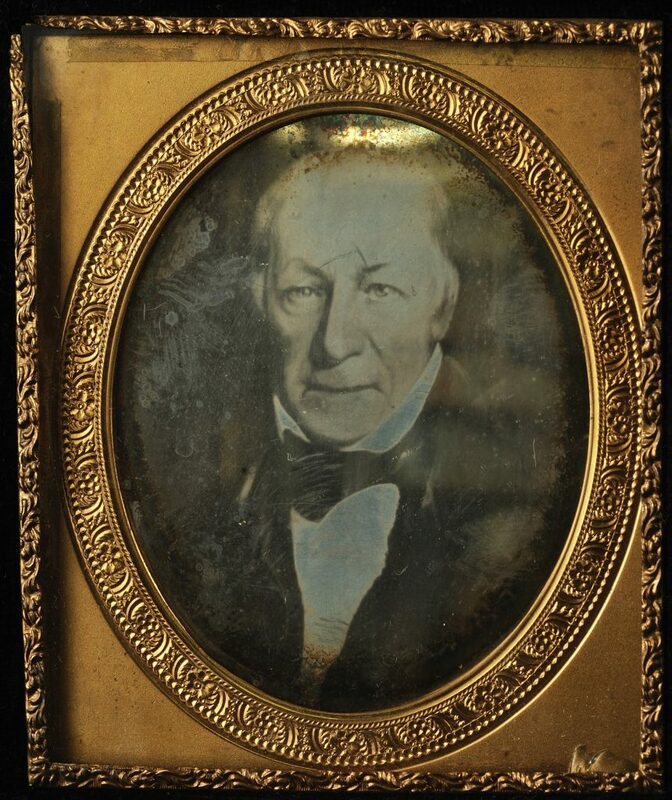 This daguerreotype was taken of a painted portrait of Watrous, now unlocated, that depicts him later in life. 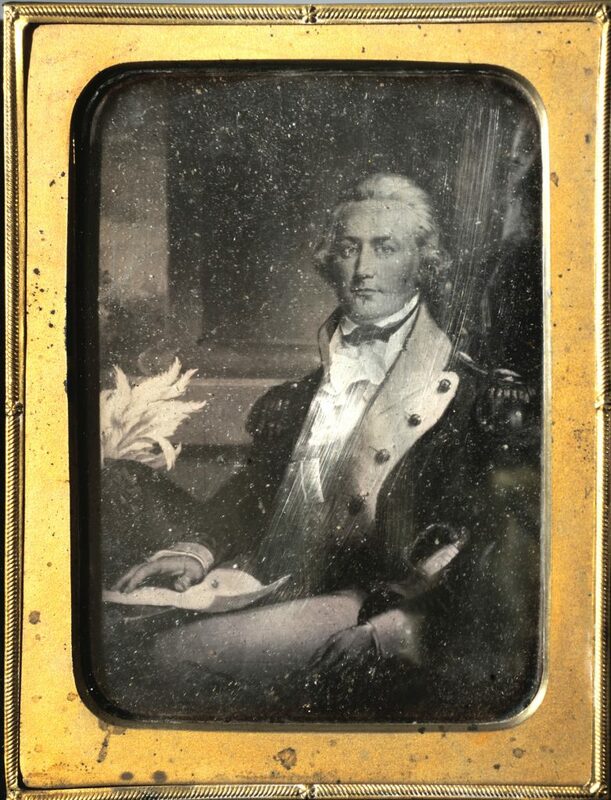 A posthumous portrait of Edward Butler (1762-1803) painted by Washington Bogart Cooper is the subject of this half-plate daguerreotype. The image pictures Butler in a post-Revolutionary War uniform, wearing a Society of the Cincinnati Eagle insignia and holding a family sword. 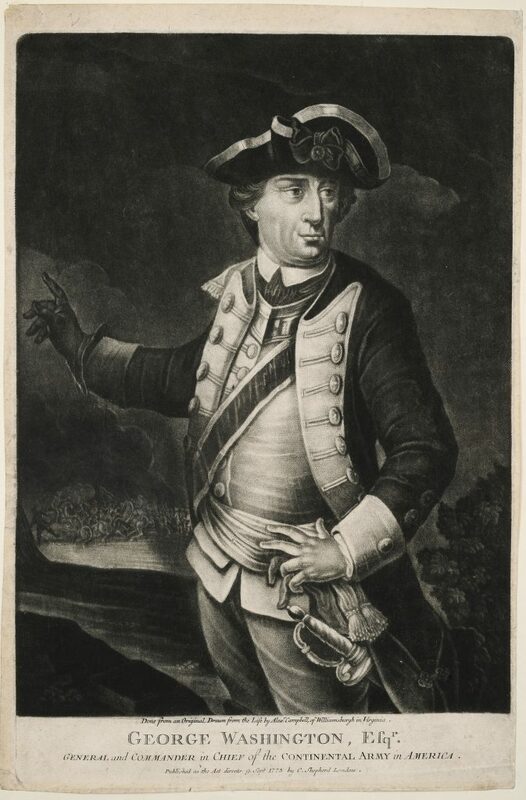 Lieutenant Butler, one of five brothers who served in the Pennsylvania Continental Line during the Revolution, fought in the southern campaign and was present at Yorktown.